Why, oh why, do they do it? 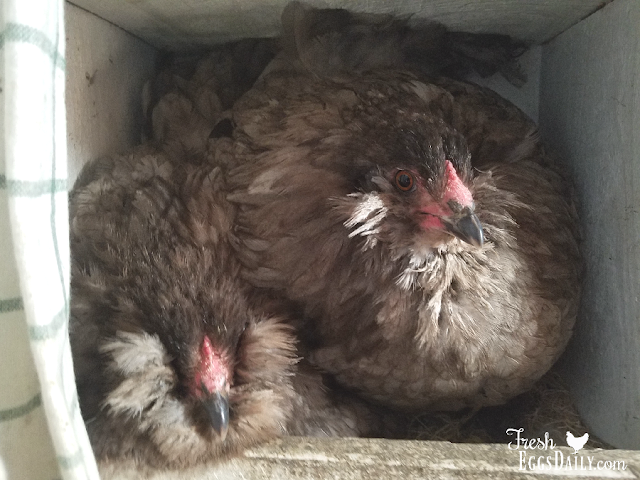 Why will chickens literally sit on top of each other in the same nesting box - or stand just outside the box and cackle and carry on until the offending hen in the box is done - when there is a row of identical boxes completely empty and at their disposal? Chickens prefer to lay their eggs in safe, private places that they feel are safe from predators. After all, in their eyes, every egg they lay is a potential baby chick to help propagate the breed. So, when they stroll past a nest and see an egg (or hen) in that nest, they think that since another hen felt it was a safe place, it must be a safe place for their egg. A second school of thought is that in a flock, all the laying hens will lay their eggs in a communal nest in order to accumulate a 'clutch' which one of them will then sit on to hatch. The faster the clutch is completed, the sooner the hen can start sitting, the more fertile the eggs and the better chance at hatching them. 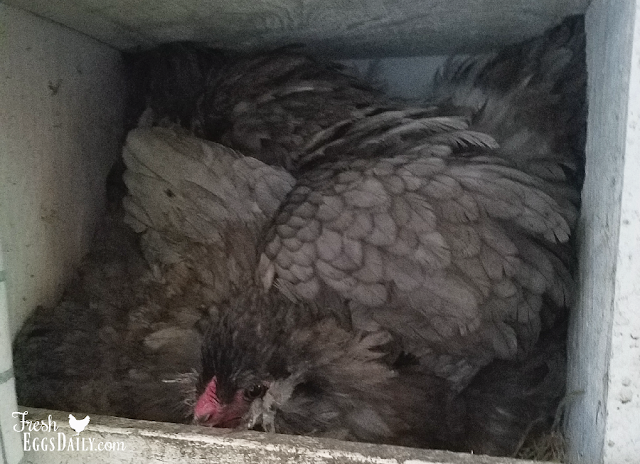 Chickens fighting over nesting boxes can result in broken eggs, which not only reduces your yield but can tempt the hens to start eating their eggs. Wars can also get pretty loud and heated, something you want to avoid if you have neighbors close by. Warring hens also are prone to peck at each other which can result in injuries. Regardless of exactly why chickens like to lay their eggs in a nest with other eggs, it's pretty clear that they do. So ending nesting box wars is pretty simple. Just rig all your nesting boxes with 'dummy' eggs. You can use wooden or ceramic eggs, golf balls or even stones. If you use plastic Easter Eggs, fill them with dirt, sand, or rice and tape them shut to give them similar heft and weight as a real egg. Place one in each nesting box. 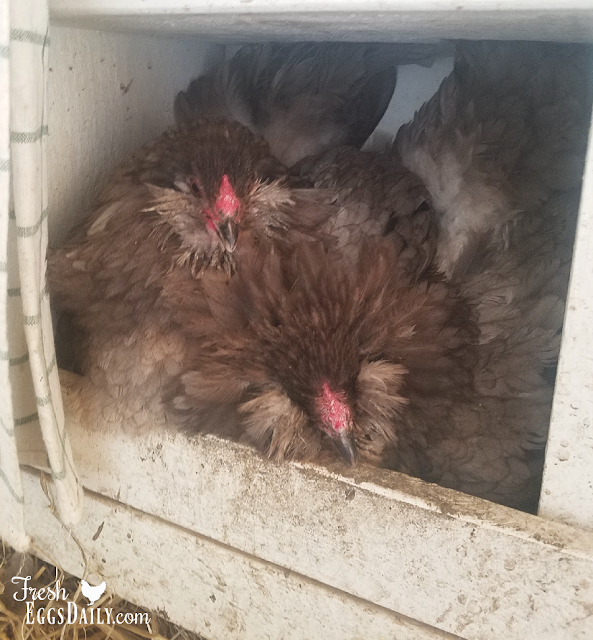 Now when your chickens are ready to lay their eggs, they will stroll past the row of nesting boxes and be met with multiple choices for a safe place to lay their egg. Chances are if there's a hen laying in a nest already, they'll just pass that one by and go on to the next one. You can leave the fake eggs in the boxes indefinitely if need be. They are also handy to deter not only egg eating hens, but also egg-eating predators such as rats and snakes. You can also try blocking the 'favorite' box for awhile and force everyone to choose another box. That sometimes helps them realize that yes, they all are identical after all! Good luck! and p.s. yes my coop needs a good scrubbing, yes, it's mud season here in Maine, and yes, I still am happy that I painted my entire coop white! I guess I should be glad my three girls take turns or sit patiently waiting...I didn't realize how it could be!!! Thank you for this blog, I just experienced it and ended up with a girl having a bleeding comb. Didn't think of putting in the golf balls because I didn't know why they were having a dispute. Thought one was becoming broody and hogging the nest. Thanks. I'll dig out the golf balls. Boy, my girls have never gotten violent before, but they sure do make a heck of a ruckus, and there are only four of them! How funny, I recently did a post on our chickens sharing their nesting boxes! Thankfully they are quite happy to share and don't fight about it. 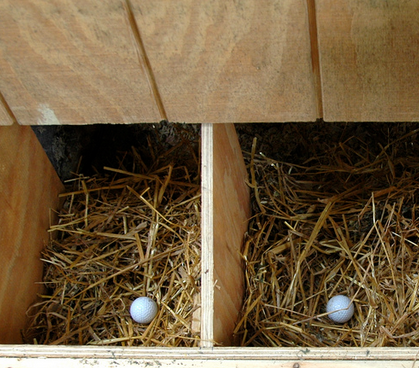 Wouldn't leaving (fake) eggs in the nesting boxes encourage broodiness? We have problems with constant broodiness in one of our chickens and I wouldn't want to give her any ideas. Wow, that is hilarious! I thought my girls were the only ones who did this! Thankfully they are polite and have learned to share! http://thewhittierhousewife.weebly.com/26/post/2014/03/learning-to-share.html! 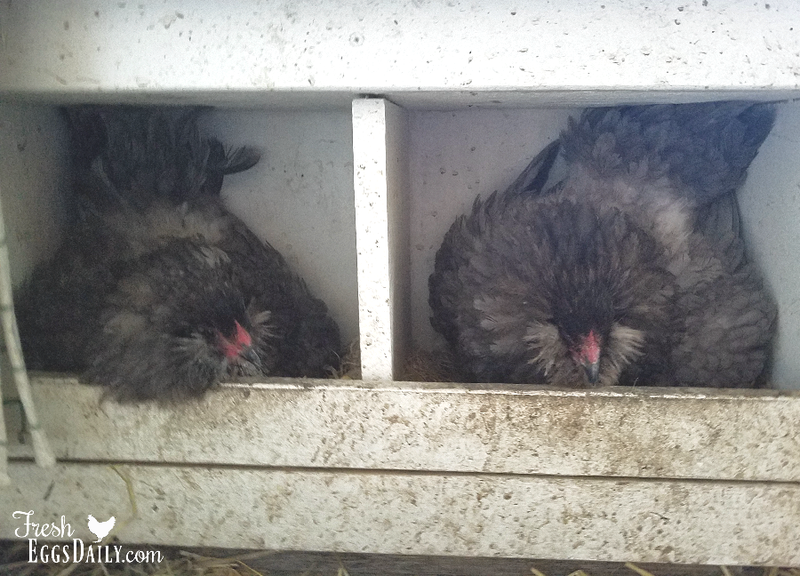 The thing about hens and nesting boxes is they don't want to see out or have anyone see in. Putting curtains over the entrances will help accomplish this. We built our nestboxes so they can't see out/in and have never had the "wars". I blew out the inside of a real egg...can I use that??? I would think it would be crushed when a hen sat on them and rolled them around, which could also encourage egg pecking/eating. The weight would need to be comparable to a laid egg. Thank you...will get some golf balls.